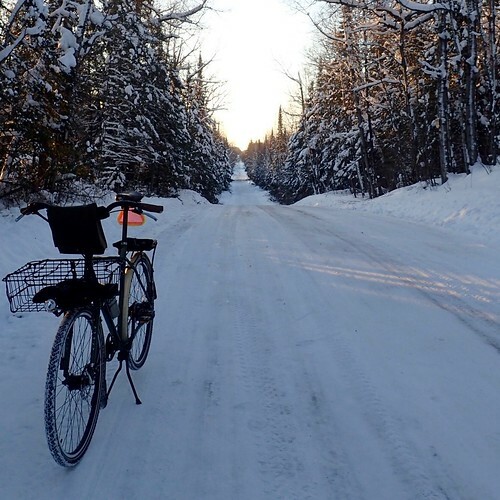 A visual journal of our outdoor adventures in northern Minnesota. 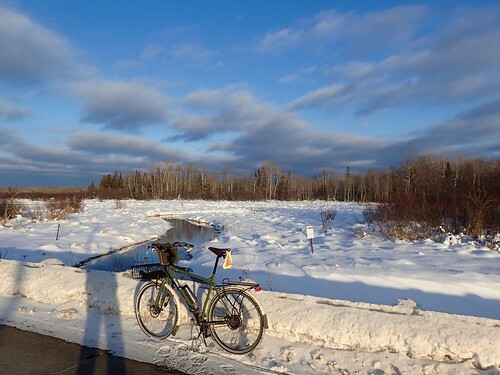 I was looking for a way to make today's ride to city hall and back a bit more interesting so, with inspiration provided by Shawn of Urban Adventure League, I decided to follow up my errand with the inaugural edition of Sunset Burrito Club: Duluth. 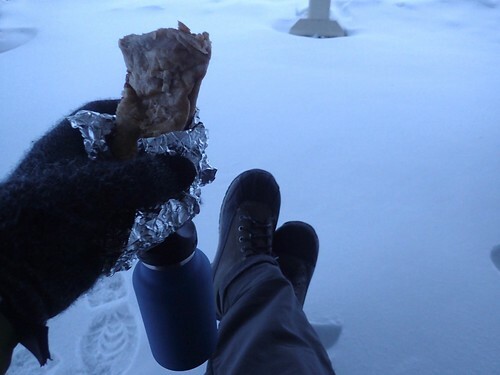 The basic premise of the Burrito Club is simple: Enjoy a burrito while watching the sunset. Since I didn't want to do a blatant ripoff of the Portland Club, I needed to find something to differentiate the Duluth edition from Shawn's. It was something I'd have to think long and hard about. Hey, I've got it! 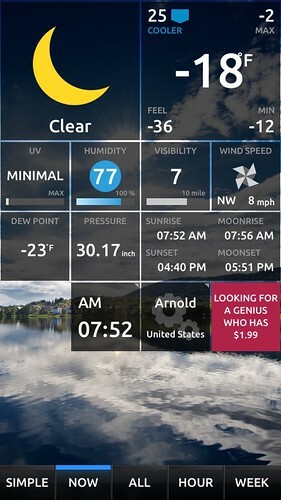 Falling snow and subzero temperatures. I can't think of a better way to say Duluth. Next, I would need a burrito. That part was easy. We had leftover roasted veggie burritos from Saturday's dinner. I heated it up in the microwave and then placed it (along with a hot bag of rice) in my specially designed burrito warmer, also known as a Granite Gear Aquatherm bottle holder. Finally, one thing any reputable sunset burrito club needs is a mascot, preferably a moose. We just so happened to have one hanging around the house, so along he came. Despite having magnets in his feet, he had to ride in the bag with my camera. This bike doesn't seem to have any steel on that he can hang on to (please don't tell the folks from the SteelonWheelsForum, or they may take away my membership). 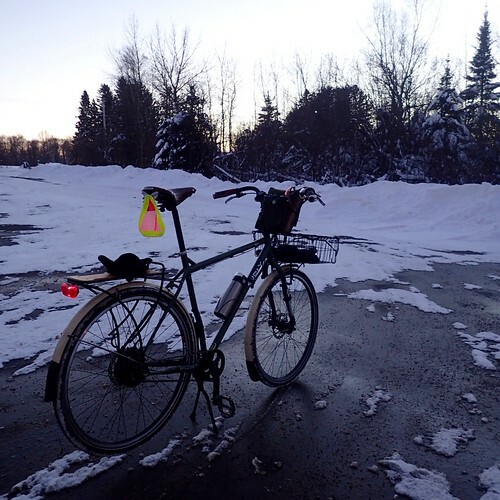 Forty minutes after leaving my house, sunset arrived at the Rice Lake City Park, and I was able to enjoy my still warm burrito while watching the snow fall. As an added bonus, to help work off my meal, I was able to go for a quick spin through the park where snowmobiles had packed down the snow. All in all, I would have to say the first sunset burrito club in Duluth was a success. Maybe next time I'll actually get to see the sunset. If I were a glass half empty kind of guy I would have looked at this morning's temperature and probably would have went straight back to bed. Today at least, that guy isn't me. I looked at the temp and thought," Hey! what a great day to test out my new Buff balaclava." Not wanting to put it to too extreme of a test, I did decide to wait until it warmed up a bit before heading out. 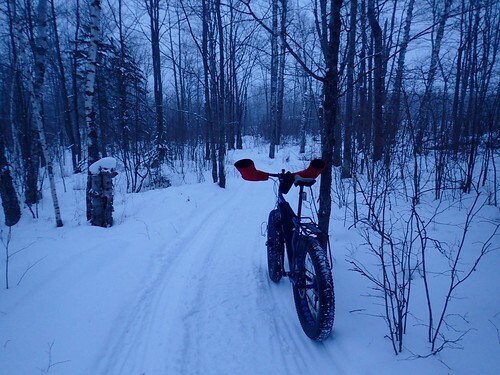 When I finally left on my ride, the temperature had climbed all the way to -2F. This isn't going to be a review per se, just a few observations on how it worked for me. The Buff balaclava is made of polar fleece with a wind blocking material covering the lower face and going around the back of the head. It has a cutout for your nostrils and several small holes for your mouth and ears. 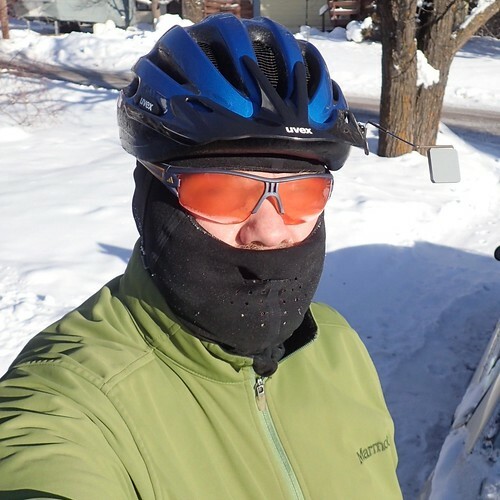 I decided to keep things short and just go around the block (2 1/4 miles) in case I had any issues with my bike or my clothing choices due to the cold. So, how did it go? 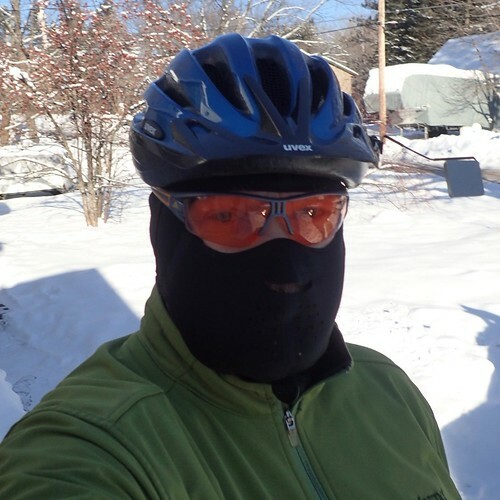 The bike performed flawlessly, my clothing kept me warm, but the balaclava was a bit of a disappointment. Despite the fact that it did keep my head quite warm, it fit so tightly that I couldn't pull it down below my nose, which led to my glasses frosting over completely. That is not a good thing. I have a hard enough time riding in a straight line without my vision being impaired. Another issue I had was with the ear holes cut outs. While riding into the wind, the air rushing past my ears was deafening. I had to turn my head to the side to make the noise go away. So, I guess it's back to my old stand by from Mountain Hardware. 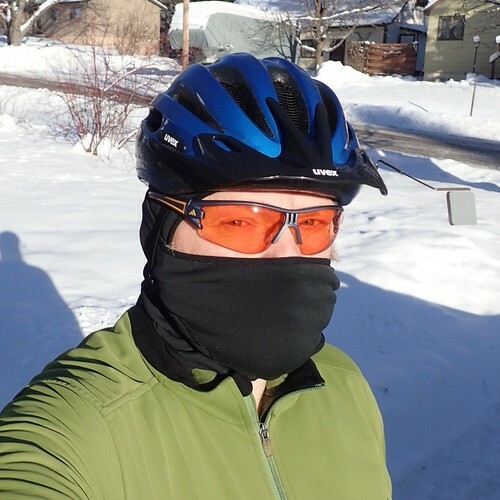 It lacks the wind stopper material so it may not be quite as warm as the Buff, but at least I can pull it away from my glasses (even under my chin if need be) to keep them clear. 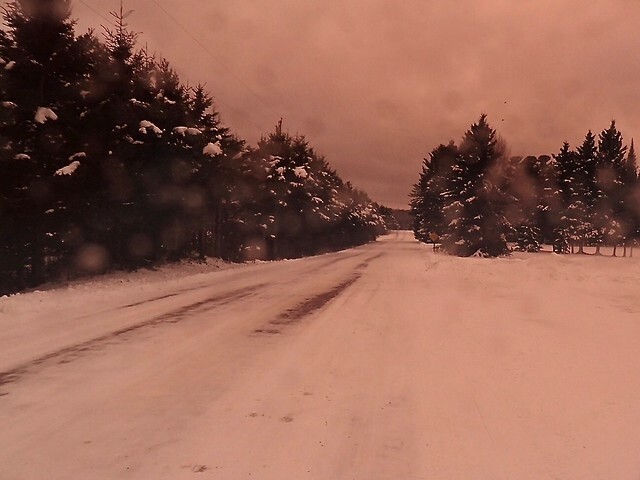 They say things look better through rose colored glasses. Whoever "they" are probably weren't wearing them while riding a bike through freezing rain. In this case, things just look better au naturale. Things are just chugging right along here in the new year. 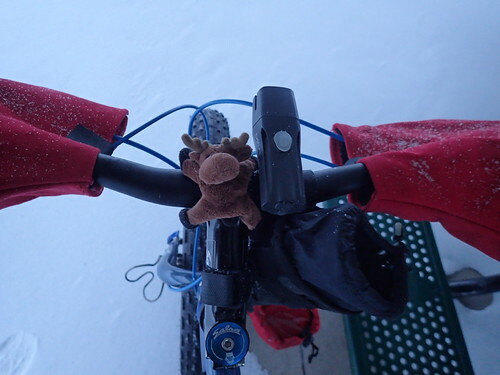 Two straight days of riding, and even more amazing: blog posts on two consecutive days! What has gotten into me? If I had to make a guess, I would have to go with caffeine. That usually seems to do the trick. Saturday's ride took me to an appointment to get my ears lowered. It's been so warm lately that I don't need quite as much insulation up top. 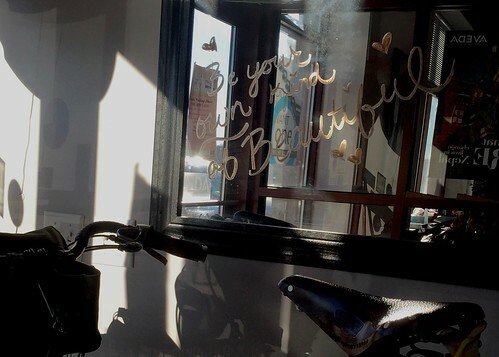 I really like this salon. You can have coffee or a glass of wine while you wait, but more importantly, I can park my bike in the entrance. Hopefully the puddle the bike left on the floor evaporates before the owner sees it. I may be parking outside next time. The temperature was pushing 30 and so was the wind. 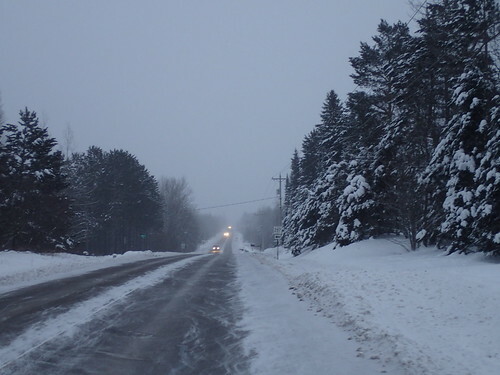 I like the warmth, but I don't like the way it softens up the snow on the side roads. It takes all of my limited talent to stay upright. On the plus side, I can always use the practice. My high school basketball coach once said, "If you don't win the first game of the season, you can't win them all." I guess the same thing can be said about biking. If you don't ride the first day of the year, you can't ride them all. With that in mind, I grabbed the bull by the horns Ogre by the grips, and headed out for my first ride of the new year. First photo of the year. Despite the green monster in the foreground, the view was quite nice. It was good to see some blue sky for a change. 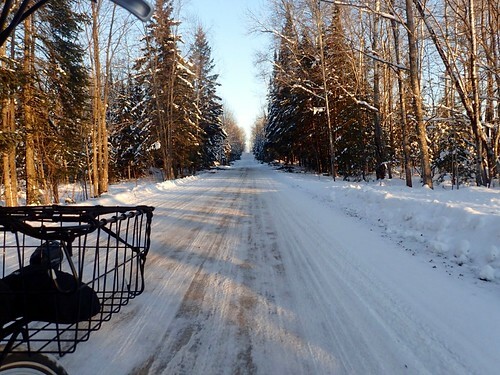 Being that it's January, not a single sign of any other bikes were seen during my entire ride. Everyone else must have been riding in town. Even though I live just outside of Duluth, it's still pretty suburban. 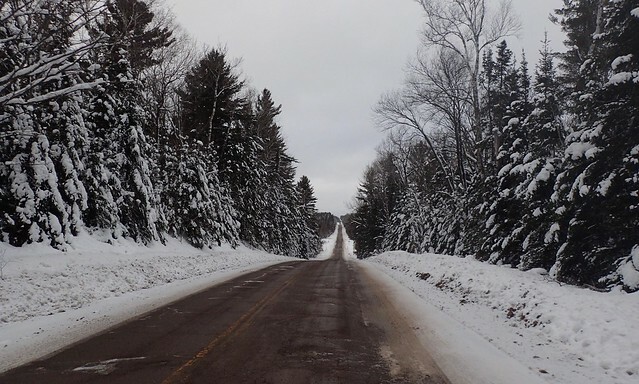 Most of the roads are paved, so when I finally get to a dirt road lined with snow covered evergreens I just have to stop and take in the beauty of it all. 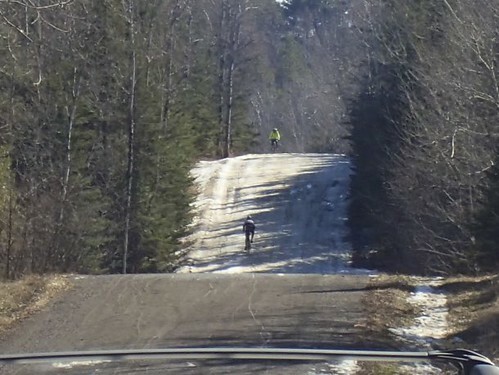 The fact that I just climbed a hill with my heavy* studded tires had nothing to do with it (ok, maybe just a little). I ended up with just a bit over 20 miles during my two hour excursion. At this rate I should end up with over 7,000 miles for the year. Seeing as my best mileage year ever was 2,600 that's pretty unlikely, but a man can dream can't he? *The tires aren't that heavy. I'm just eternally out of shape. 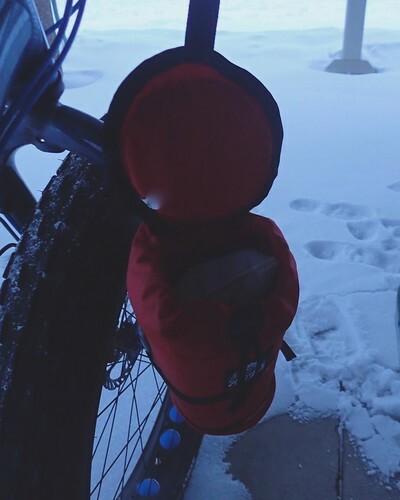 This past Monday, after waiting out the rain, I completed my ninth and final errand of the 2015 Errandonnee season. This last one was and easy one. 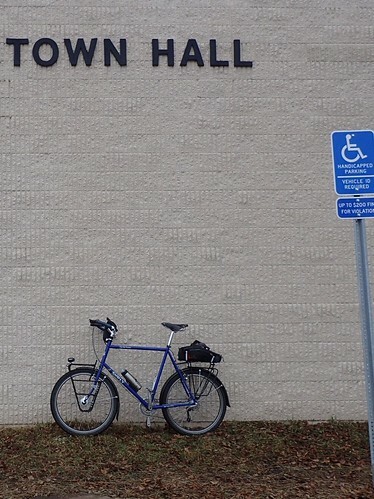 A ride to the town hall to pay the water bill, the one errand I try to do by bike every month. Nine out of twelve isn't too bad. Should be worth an honorable mention anyway. I really wanted to do all twelve, but between the rain that day and my feeling of being a bit burnt out from the miles I put in that week, I just wasn't feeling it. Well, there's always next year. Observation: Why is it I spend almost $400 to equip my bike with lights, yet practically every car driver I see can't be bothered to turn on the lights that their cars came with? Hey! After four years of blogging, I think that was my first ever rant. Here's to four more years of positivity. 9 errands from 6 different categories. Thanks for putting this on MG! I look forward to doing this again. Since temps were in the fifties and the roads were clear on Saturday, I decided to take the Trucker out for it's first voyage of the year. 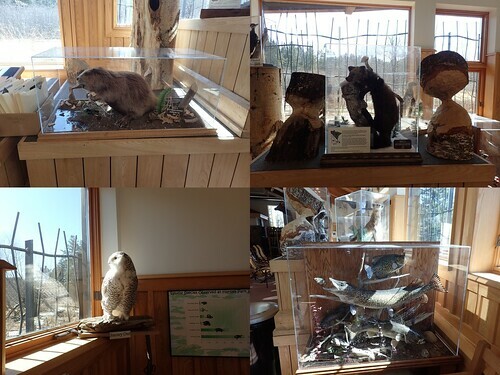 My first stop was to Hartley Nature Center to see if there was anything new going on since my last visit. 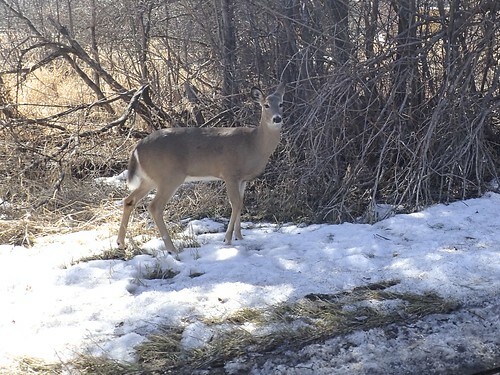 I passed by the official greeter on the road to the parking lot. As is normally the case, I had the rack to myself. I don't believe many people ride their bikes to get here. 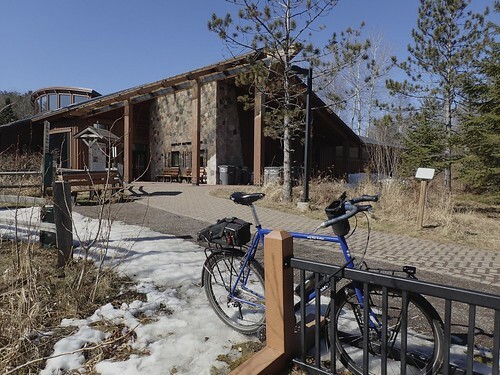 Most drive here with their mountain or fat tire bikes to ride the trails, which is something I really should start doing once in a while. I'll skip the driving part though, as it's only a couple miles from my house. Once inside, I wandered around and checked out the exhibits showing wildlife that is local to the area. I was going to say local to the park, but I doubt there are any Northern Pike in the nearby pond. 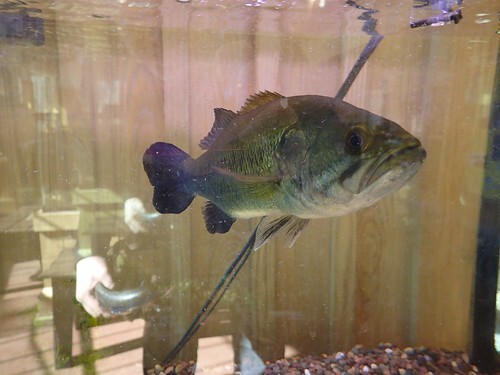 This guy's name is Billy. I didn't here him sing. 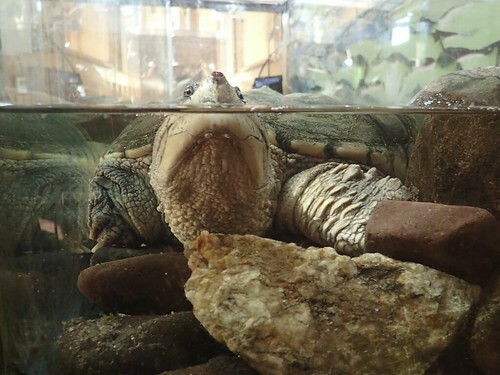 Being this close, I'm glad this Snapping Turtle is behind glass, although I would be more glad if it was outside, free in the water. After leaving the kept animals at Hartley, I decided I needed to be around some that were a bit more wild. 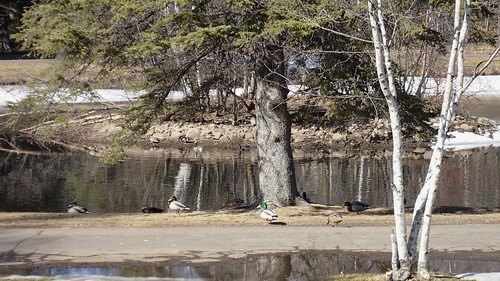 A short while later, I found myself at a nearby cemetery that has a duck pond, and believe it or not, ducks! Not wanting to spook them all into the water, I gave them their space and made my way towards my next mission: Seeing if the scenic route I sometimes take on my commute home from work is open for the season yet. 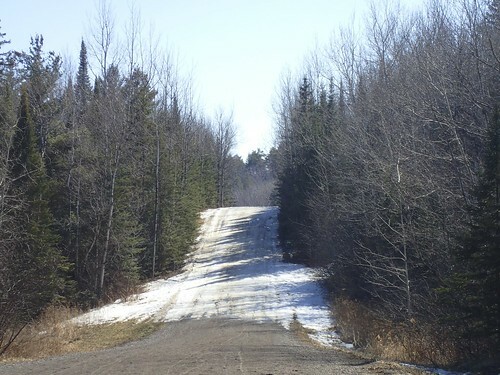 After going around a road closed barricade, I found that it was not ready for riding yet. Oops, spoke too soon. Well, if guys on road bikes can make it through I guess I can probably make it too. Plus, I won't be riding this road home until Wednesday at the earliest. The snow will probably be gone by the time I come through. Observation: I need to take better advantage of the amenities that are just outside my doorstep. Observation: A ducks place is in the water, mine is on my bike. Observation: Looks can be deceiving, or maybe I'm just a wuss.